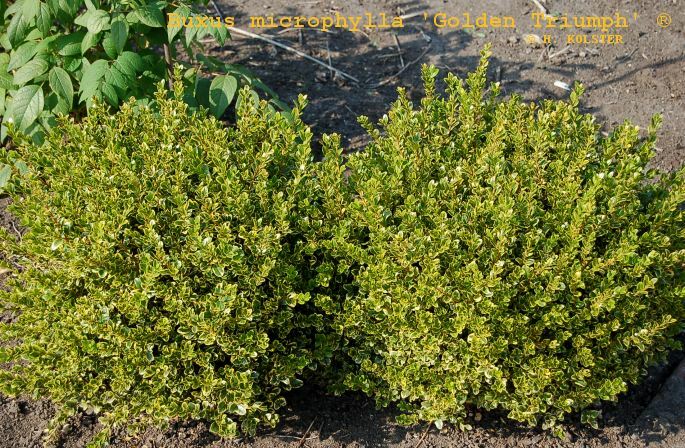 The new Buxus microphylla 'Golden Triumph' PBR is a selected sport (mutation) from Buxus microphylla 'Faulkner'. The plant grows broad globose; the leaves look like Buxus microphylla 'Faulkner', are shining, but the margins are light golden-yellow, showed well as the leaves are full-grown. The young new growth is light green. The plant shows the best, grown as a ball, planted in a tub on the tarrace or as an ornamental in the border. Also you can use it to make small hedges; the lighter coloured leaves of Buxus microphylla 'Golden Triumph' PBR subsides your eyes. Take also a look at the website of www.Plantipp.eu, here you find a lot of new protected plants.